The issue of pressure at some of the country’s most popular tourism sites has gained much media coverage over the last few months. Dubbed ‘over-tourism’, the term has been used in popular media, here and overseas, to describe the scale of the threats to the environmental and social fabric of local communities in these prime locations. The problem is not necessarily one of too many tourists, per se, but rather the over-concentration of visitors at honeypot sites, most notably in the peak seasons. Another consideration is what tourists do when they are at these sites. A beautiful natural landscape inevitably attracts visitors, but a mere stop-and-selfie before moving on to the next site on the bucket list can hardly be called a visit, can it? Some of the places that are now known as honeypot sites and that unfortunately received negative publicity because of the sharp increase in visitor numbers have reported that numbers were not necessarily higher in 2018. The concentration on roads and key sites has been noted, however the number of visitors aren’t necessarily always higher. It seems, therefore, that people who visit the destinations where the honeypot sites are located are following the same patterns. People seem to be going to the same sites, spending a short amount of time in a place, potentially spending little money locally because they are trying to visit so many places in one holiday or trip. Ultimately, more and more people are behaving in the same way, quite often because of the power of social media and successful marketing campaigns. 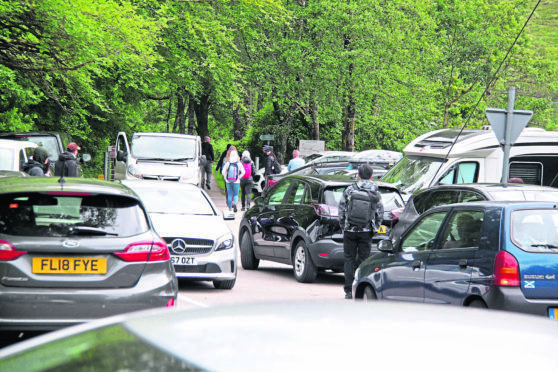 If one of the main issues is the way people behave in popular tourism sites, the key to creating a more sustainable future for these sites and potentially for tourism in Scotland is to change visitors’ behaviour. Investment in suitable infrastructure is important, but is it a sustainable solution as a stand-alone measure? Probably not. It is a short-term solution for a current problem. We need places (or, in tourism terms, destinations) to develop long-term sustainable tourism management plans in collaboration with communities and local organisations. We also need to change the way visitors behave in the places we cherish, the places we call home. If we decide to attract visitors in the first place, then we also need to encourage them to dwell longer, to visit the less well-known and less-congested areas and experience the place in all its timeframes, in all seasons, by actually connecting with the place through an activity and with the people who live and work there. ‘Slow adventure’ tourism could help to attract people to some of Scotland’s wilder and unspoilt areas and could change the way visitors behave in popular tourism spots. Slow adventure derives from an academic paper by two University of the Highlands and Islands academics, who suggested an antidote to people’s frenetic urban lives, encouraging people to enjoy and experience the outdoors at a slower pace. Rather than mass tourists scratching the veneer of Scotland, slow adventurers immerse themselves in wild places and engage with local people, stories and food. It appeals to an affluent urban consumer base and captures a customer appetite demonstrated by the many bushcraft or escape programmes and stories in popular media. Slow adventure was developed as a marketing concept in a recent transnational project, which was led by UHI and co-financed by Interreg Europe’s Northern Periphery and Arctic programme. Facilitating the collaboration of local businesses, regions across Scandinavia, Ireland and the UK have developed a wide range of slow adventure products, from foraging and kayaking in Lochaber to cycling and sauna in Finland. The Centre for Recreation and Tourism Research at West Highland College UHI in Fort William is now looking to develop slow adventure as a ‘movement’ that will encourage businesses from other destinations and regions, in Scotland and beyond, to develop their own unique sustainable tourism products. It is clear from discussions with businesses, tour operators, marketing bodies at international events and with visitors, that slow adventure is a marketing brand that does capture the current consumer appetite for more authentic and immersive experiences. And slow adventure recognises that Scotland’s landscapes have so much to offer in the cooler seasons – and more visitors appear to be waking up to the fact that late spring or the autumn is, in many ways, the time to see the best of the Highlands. The creation of these tourism alternatives is not trying to reduce the number of tourists to our shores. While also appealing to a more affluent consumer, slow adventure seeks to take people off the well-trammelled tourist trail into the wilder and less developed areas of the Highlands. And, rather than the rush to ‘do Scotland’ – do we not have enough haste in our everyday lives? – it’s about getting to people to slow down, stay a while, learn something new and let stories, not selfies, narrate people’s experience of the Highlands.